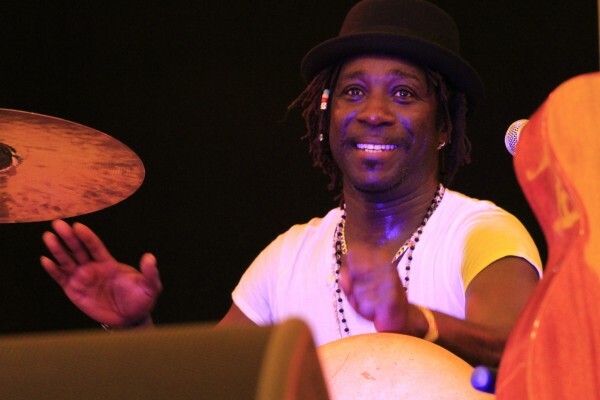 Singer, songwriter, multi-instrumentalist Amadou Diagne comes from a Griot family line of traditional percussionists and praise singers from the area around Dakar, Senegal. Though unmistakably a West African musician, since moving to England Amadou has been enjoying finding a unique musical identity, being inspired by meeting, and collaborating with, musicians from many different backgrounds. Amadou writes and performs his own music as well as putting his own reworking on traditional songs from Senegal, moving from guitar to djembe, drum to kora. A love of improvisation and eclectic musical inspiration are evident when he plays, exploring and delighting in the rhythmic possibilities within the melodies he composes. Amadou performs primarily in Wolof, the most spoken language in Dakar. He mixes in other West African dialects such as Pular and Manding and occasionally English and French as his lyrics reflect his experiences of the world, and of the African Diaspora. Amadou’s infectious music and humour went down a storm on main stage 2. From Casamance in Senegal, Seckou Keita is both a member of the royal Keita dynasty from Mali (through his father), and a griot, a traditional West African praise singer (through his mother’s family, the Cissokhos, from Senegal). He has built a formidable reputation as an inspired exponent of the kora. Harpist Catrin Finch is one of Wales’ leading international musical ambassadors, and one of the world’s finest players of this most Welsh of instruments. The “Queen of Harps”, Catrin was Royal Harpist to HRH The Prince of Wales from 2000 to 2004. Her concert appearances with the world’s top orchestras span the globe and she has worked alongside artists such as Bryn Terfel, Sir James Galway and Julian Lloyd-Webber. 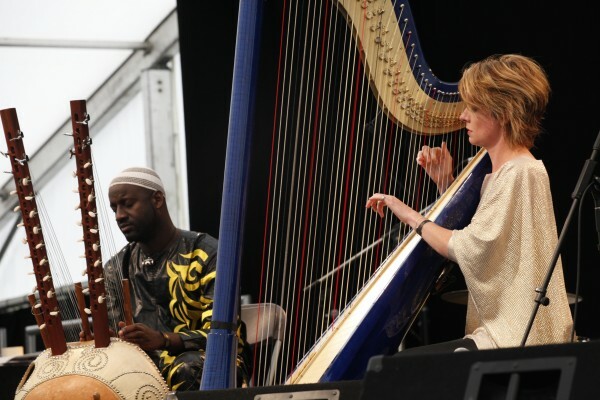 Hot on the heels of her innovative collaborations with Cimarron from Colombia and Toumani Diabaté from Mali, Catrin Finch is once again proving her radical and adventurous musical spirit with this wedding of Welsh and West African musical culture. The duo’s performance on main stage 2 received a standing ovation! Folk Nations is an exciting concept that highlights folk culture from the UK and India. The project brings together musicians, artists, and the wider creative community to share ideas and explore new work. 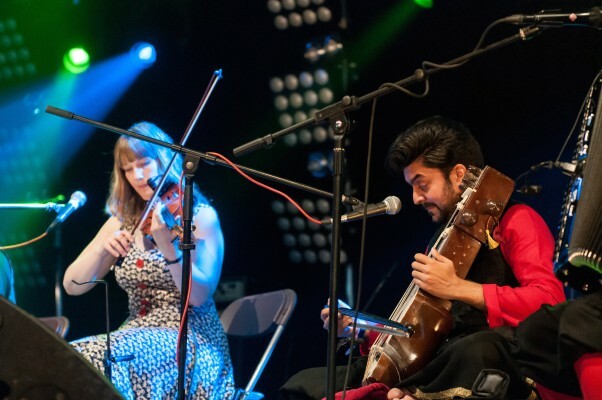 An idea that began in 2012, Folk Nations has now worked with more than 60 artists from England, Scotland, Wales, and India in showcase performances, artist residencies, networking opportunities, and outreach workshops. It continues to grow and embrace new and contemporary music with a folk core. 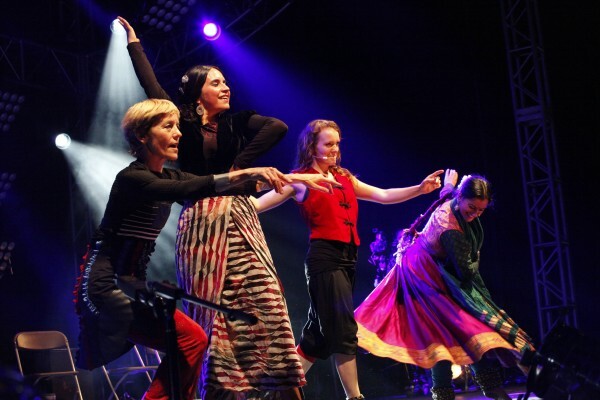 This troupe is an outcome of Folk Nations, a programme by the British Council that highlights folk culture across the UK and India through music. Shrewsbury Folk Festival will witness performances by renowned musicians Patsy Reid (Scotland), Hannah James (England), Georgia Ruth (Wales), Saurav Moni (India), Suhail Yusuf Khan (India) and James Mackintosh (Scotland). It represents a delicate weaving of UK and Indian folk that speaks immediately to the cultural heritage of these regions as well as its place in the contemporary music industry. They performed on the main stage on Monday afternoon. Good Vibrations was a percussive dance piece commissioned by Shrewsbury Folk Festival as part of All Together Now, performed on the main stage on the Monday of the festival. Good Vibrations brought together an all-star line up of musicians and dancers from Spain, India, America and the UK. The piece explored rhythms and styles from the different cultures and delved into the more basic patterns and rhythms that are within us all, beneath culture and spoken language. Good Vibrations featured: Hannah James (UK) clog dancer; Sandy Silva (Canada) percussive dance; Sonia Sabri (UK/India) Indian Kathak; Natalia Garcia-Huidobro (Spain) Flamenco dance; Cormac Byrne (UK) percussion: Giulians Modarelli (UK/Spain) Flamenco guitar; Karen Tweed (UK) accordion; and (pictured) Suhail Yusuf Khan (India), Sarangi. Harare was one of the first acts to play at the 2015 festival, performing on the Village Stage on Friday. They are one of the few groups to be playing Zimbabwean dance music in Europe. 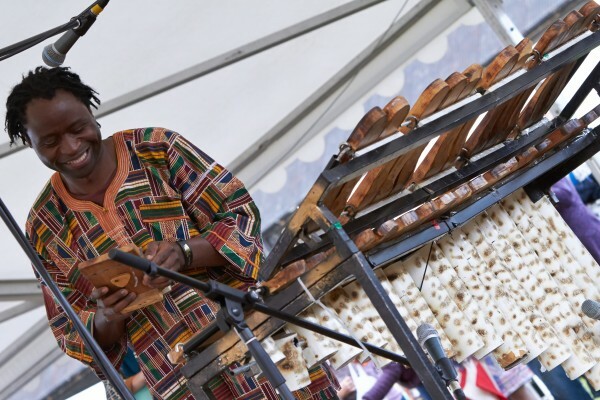 Formed by a musician from the heart of Zimbabwean urban music, Harare combines different styles from jit jive to traditional hypnotic rhythms of the mbira (lamellaphone/thumb piano). Harare music is also heavily influenced by chimurenga, the genre developed by music guru, Thomas Mapfumo. The four-strong band are fronted by the exuberance and charisma of Zimbabwean musician Kuda Matimba and feature a ground breaking line-up, mixing the buzzing acoustics of the Southern African marimba and mbira, lead and bass guitars and drum kit. A virtuoso marimbist, Kuda Matimba was a member of the Zimbabwe’s legendary Bhundu Boys. Bhundu boys were a groundbreaking force in the African music industry, as they paved the way for more artists to reach commercial success in Europe and the US. The band closed the main stage on the final day of the festival. They first appeared on the Quebec music scene in 1976 and is a living legend of French North American roots music. 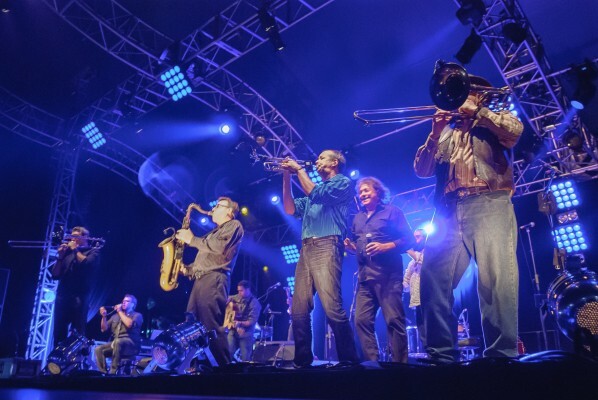 After several years performing in the standards of the traditional repertoire, the band released the album “Je Voudrais Changer D’chapeau”, a first experience of musical fusion. The addition in 1991 of a horn section which started to develop a distinctive sound all its own that successfully allies its homage to tradition with a dash of jazz, salsa and pure folk, while at the same time perfectly representing the symbol of vitality and pride of its mother culture. The band’s popularity has exploded over recent years both internationally and in Quebec. It is directly into this turbulent energy that La Bottine Souriante sweeps its rapturous public. We are very grateful for an investment of £86,410 from the National Lottery through Arts Council England, Shropshire Council for a £5,000 Arts Development award, and Shrewsbury Town Council for a £2,000 grant. The festival will meet the remaining cost of the programme.